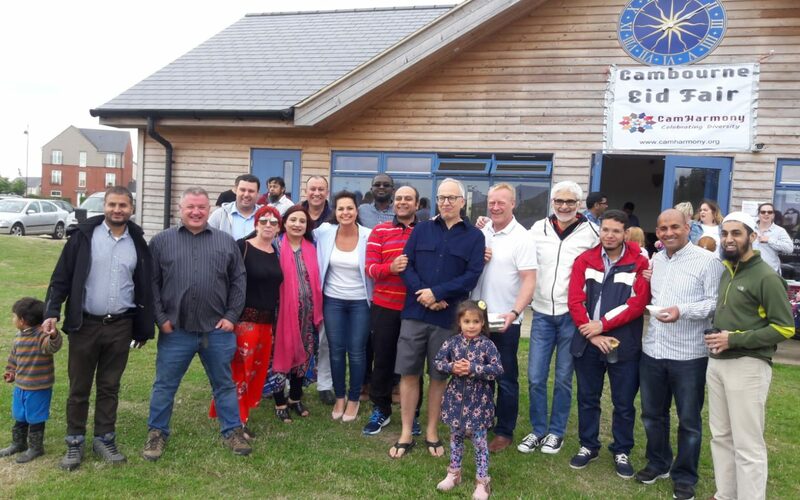 The remarkable success of the First Cambourne Eid Fair held on Sunday, 2nd July 2017 at New Cricket Pavilion, Upper Cambourne, established an efficacious integration of all the communities to promote good relations. Eid is a festival of Muslims celebrated after completion of one Month of Ramadan when Muslims fast from dawn to dusk. The Arabic word ‘Eid’ itself means ‘Celebrations’ and at the Cambourne Eid Fair, Muslims rejoiced with the wider community to celebrate Diversity. The stalls, the food, the people, everything represented one vibrant community having fun together. The variety of mouth-watering international food, the fabric and jewellery stalls along with the cheerful children showing their pretty face paints and henna to each other while bouncing on the inflatables gave an exceptional ambience to the event. The children also came forward to have interactive sessions to explain about Ramadan, Eid and importance of Peace friendship and harmony by their lovely meaningful posters. This inclusive event was well attended by the families and individuals from Cambourne, Cambridge, Huntingdon St. Ives, St. Neots, and all the nearby villages to make a peaceful and merry gathering of more than 1500. It was wonderful to see the people enjoying together, irrespective of their cultural, religious, and ethnic backgrounds to celebrate this Eid fair. Weather was kindly very favourable to facilitate the family outing. Thanks to every individual for their participation and support in various capacities to make this event successful. We look forward to enjoy many more valuable events together.